Buying a coffee maker with grinder can be a life-changing experience. That’s because these machines are two useful tools fused into one product. These machines save time and in many cases, even save counter space. They can also simplify the whole process of making coffee, allowing the coffee drinker to spend more time doing the things they love. All of which makes these coffee makers pretty remarkable appliances. However, that’s not to say that all of the models currently manufactured are worth having because that’s clearly not always the case. There are some coffee maker models that should be avoided. 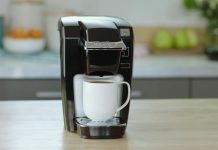 That’s why we’re taking a few moments out of our day to show the top ten combination coffee pots, and then we’ll follow those appliances with some advice on taking care of your new device. This machine is designed to make grinding your own coffee and brewing as simple as possible. It has a high-quality steel conical burr grinder that designed to provide a consistent grind each and every time, no matter which of the 5-grind levels the user selects. This machine can make as few as 2-cups of coffee, or as many as 10-cups and the user can select from three possible strength settings: mild, medium and strong. Other features which can be found on this coffee maker include an automatic shut off feature, a water filtration system, and a pause and serve feature which allows the user to serve coffee before brewing has finished. All of the features a person needs to make a nice cup of coffee can be found on this coffee maker/grinder combo. 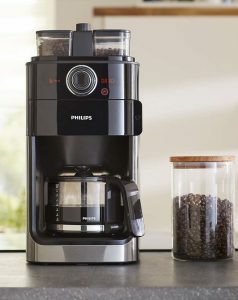 It has a burr grinder that automatically grinds ups coffee beans before brewing. It also has an 8-ounce bean hopper that has a unique sealed lid which prevents moisture from getting in and ruining the beans stored in it. Another interesting feature on this machine is a strength selector which allows the user to choose between mild, medium or strong brews. Other features include the ability to program it to brew between 2 and 12-cups of coffee and an elegant brushed stainless steel design. Although this coffee maker has a beautiful style and looks good in just about any kitchen, the real beauty of this machine is the control it gives the user over their coffee brewing experience. This machine has 6-grind settings which allow the user to choose the optimal grind for their particular type of coffee. It also has 8-strength settings that allow the user decide how strong the coffee should be. The user can also customize the number of cups they want, choosing from a single cup to up to 12-cups of coffee. And if the user doesn’t want to use fresh coffee beans, they can even choose to brew using plain ground coffee if they desire. This 1000-watt coffee machine with grinder has a nice style to it, but also has many of the features that coffee drinkers look for in one of these products. It has a digital control panel with a clock and a timer and is easy to program. This machine can also deliver up to 5-different grind settings, 3-different strength setting, and 5-different brew amounts. It’s equipped with a 6-ounce bean container and a grinder with steel conical burrs for a perfect grind. Other features that can be found on this machine include a slow grinding mechanism that prevents heat buildup from affecting bean quality, a 10-cup stainless steel carafe, and a gold tone filter. This coffee maker with grinder not only looks good but it has several innovative features. It can be programmed for a 24-hour cycle and has auto-shutoff, grind off and brew pause features. It also has an 8-ounce bean hopper and an automatic burr grinder. This product allows the user to select the strength of their brew and also the grind of their coffee beans. It also uses a charcoal water filter to remove impurities from the water, resulting in a better tasting coffee. Another great feature of this machine is that it uses a double-wall insulated stainless-steel carafe that can hold up to 12-cups of coffee. This 10-cup coffee maker has a number of features which make it a useful kitchen appliance. It has an LCD display, an on/off button with an LED indicator, gives out an audible tone when brew cycle is complete and has a grind off button. This machine is easy-to-program, has a charcoal water filter and has a double-wall stainless steel carafe. 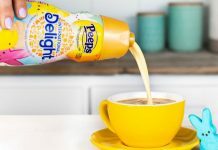 It’s made with BPA-free components and can be used to make coffee using either coffee beans or grounds. It also has a 1 to a 4-cup setting, so the coffee enthusiast can brew the amount of coffee that they need. This Black & Decker coffee maker/grinder can brew up to 12-cups of coffee at a time, and the user doesn’t have to buy a separate coffee grinder to make fresh coffee. This product has a bronze tone permanent filter which is attached to the integrated grinder, so the user doesn’t have to worry about using wasteful paper filters. This machine also has a brew strength selector, is very easy to program and provides a complete grind to brew experience. It even has a sneak-a-cup feature that allows users to take a cup of coffee before the brewing process has been fully completed. This 12-cup coffee maker is designed so that the user doesn’t have to spend a whole lot of time making their morning coffee. It has a 24-hour programmable design that allows coffee drinkers to wake up to their favorite brew each day. It has a built-in grinder that automatically grinds the coffee beans before they are brewed. It also has a coffee grind control that allows the user to set the grind from fine to coarse and strength selector that allows the user to select from weak to strong brews. This coffee machine uses a charcoal water filter to deliver the highest water quality possible and uses a gold-tone coffee filter to filter the water through the coffee grounds. This coffee machine is not only stylish looking, and inexpensive but is also designed so the user can have a hands-off approach to their coffee making routine. The user can program a time to start their coffee, and once the coffee has been brewed, it will keep it warm for up to 30-minutes. It has a 2-ounce bean capacity and can brew up to 10-cups of coffee at a time into the glass carafe. This product has a stainless steel body, a clear water gauge, and is ETL certified. All of which makes this a serious machine for anyone who wants to turn their coffee beans into a cup of high-quality coffee without having to purchase a separate grinder. With a 24-hour programmable clock, a 12-cup glass carafe, and an auto-shutoff which can be set from 0 to 4-hours, this coffee machine is designed to handle the coffee brewing process from start to finish. It can grind whole beans before the brewing process, or if the user would rather use store-bought pre-ground coffee, then the grind feature can be turned off. This machine can brew normal brew strength or can make a stronger cup of coffee using a slower brew process. Everything considered this machine is a good automated coffee machine that delivers a nice cup of Joe easily. One of the first things a first-time owner of a combination coffee maker and grinder appliance is learning how to take care of it. When you own a stand-alone coffee maker, it’s a fairly simple process to keep it clean and in good working condition. The same is true of a grinder. It’s a device that’s easy to take care of. However, when you combine the two devices into one appliance, then it greatly complicates the care of said appliance. There are a lot of different parts to these machines that need to be properly maintained. If these parts aren’t properly maintained, then the machine isn’t going to work correctly and may even cause the machine to stop working altogether. And that’s why we’ve decided to give coffee drinkers the information they need to keep their machine in top working condition. So let’s not waste any more time and get right down to it. Before we proceed, it’s important that you understand that you should read and follow all directions for your coffee maker/grinder. And the directions that came with your appliance are the ones that should be followed. Since not all of the tips we’re going to give in this guide are appropriate for every single machine, it’s important that your machine’s instructions are followed faithfully. Therefore, manufacturer’s instructions may make certain parts of this guide irrelevant. Please keep that in mind. Before beginning any cleaning procedure, it’s important that your device is off and has sufficiently cooled down. For safety reasons, some machines also require the device to be unplugged from the wall socket before starting to clean it. It’s suitable to wipe down the exterior of most machines with a damp cloth to remove any stray coffee grounds or dust that may have accumulated on the device. On some coffee makers, it’s also acceptable to wipe down the power cord and the carafe warming plate. Most machines have removable parts that can be removed and washed in warm soapy water. This can include the grinder basket, the grinder basket lid, the carafe and the carafe lid. If your instructions state that these components are washable, then wash them in warm soapy water and allow them to completely dry before putting them back on the machine. Most of the coffee maker/grinder models that I’ve seen allow the user to descale them on a regular basis to keep them clean, which is good for residents who live in areas with hard water. Hard water can affect the performance of any appliance and will eventually kill it if left untreated. And that’s why it’s a good idea to use purified water to brew your morning coffee. If your machine does require to be descaled, however, the following steps will allow you to do it quickly and efficiently. As I’ve stated repeatedly, be sure to consult your manufacturer’s care instructions before trying to clean your machine and make sure you follow them to the letter. With that being said, here are the steps to decalcify most coffee makers. Make a Water/Vinegar Mixture – Make a mixture that’s ½ distilled white vinegar and ½ purified water. Fill up Water Reservoir – Pour this water/vinegar mixture in your water reservoir. Run the Coffee Maker – Turn the coffee maker on and run it as if you were brewing a pot of coffee. Turn Machine Off/Discard Mixture – Turn off the coffee maker and then discard the water/vinegar mixture. Rinse the Machine – Fill up the water reservoir with clean water and run it through another cycle. When this water has been run through the machine, turn the machine off and discard the water. Now that we’ve covered the most common steps for cleaning these devices, it’s time to turn our attention to a few safety matters. Below are some of the things that should be avoided when using, cleaning and maintaining your appliance. Only Use Coffee Beans in Grinder – With some standalone blade grinders, you can clean them by placing uncooked white rice in them and then grinding the rice to a dust. This allows the blades to be cleaned quite nicely. However, this should never be attempted with your coffee maker/grinder combo. Never place anything but coffee beans into your machine. Don’t Get Water Into Grinder Motor – Be extremely careful while cleaning or using your device to never get water into the grinder’s motor. This can damage it and may present a safety risk as well. Don’t Use Hard Water – I understand it can be difficult to avoid hard water in some areas and some people may not be able to filter their water. However, when possible, the user should avoid using hard water in their machine and also should select water that’s odorless and tasteless. 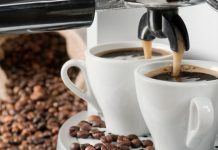 Use the Proper Amount of Beans – It can’t be emphasized enough that you should follow the number of coffee beans that your machine’s manufacturer suggests. Don’t put too little or too many beans into your machine. Avoid Getting the Machine Wet – Be sure that you keep your machine away from wet areas. Don’t store them near sinks or other moist areas of your home. Also be sure to avoid getting the base unit wet. This could pose a safety risk and/or destroy the machine. Don’t Heat an Empty Carafe – In most cases, leaving an empty carafe on the machine’s warmer is a bad idea, especially if it’s made of glass. Glass can become brittle when hot and heating an empty carafe can push the glass beyond its structural limits. Use The Carafe Only in The Machine – Don’t use the carafe of your machine in unacceptable ways. This means that you shouldn’t take it off of the machine and place it on the stovetop, for instance. Doing so can weaken the glass and result in it being susceptible to breakage. Never Use a Damaged Carafe – If your carafe is cracked or otherwise damaged, then don’t use the machine. Heating a damaged carafe can cause it to fail or shatter unexpectedly.